Capsicum habanero is a perennial pepper growing to 60-90 cm high and means from Havana. Technically, their species name is Capsicum Chinense Jacquin. It is an extremely hot pepper believed to originally have been taken to the Yucatan Peninsula from Cuba. They are also grown to a lesser extent in Belize, Costa Rica, Texas and California. They can live many years in pots. It is in leaf all year, in flower in Spring and Summer, and followed by the fruits. Their average size is 1 to 2 1/2 inches long, 1 to 2 inches in diameter. The fruit is pear-shaped, tapered and twisted, ripens from green to orange and very aromatic. 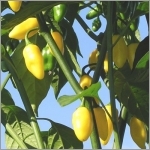 In tropical and sub-tropical regions, the Habanero, like other chiles, will produce year round. Fruits matures in 95-100 days. The habanero is the most intensely spicy chile pepper of the Capsicum genus. Extremely Hot 100K-300K (Scoville Units), 100 times hotter than Jalapeno.